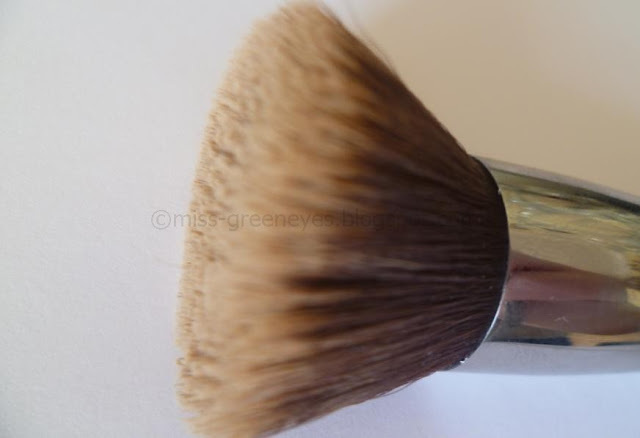 Behind Green Eyes: Now THAT's what I call a brush cleaner. Have you ever bought something so good that you feel like ringing someone to come over and witness its greatness immediately? That's how I felt today. Let me present - the tale of the Sigma F80. I got my F80 from Cloud 10 Beauty earlier this year, after reading numerous reviews about how good it was. 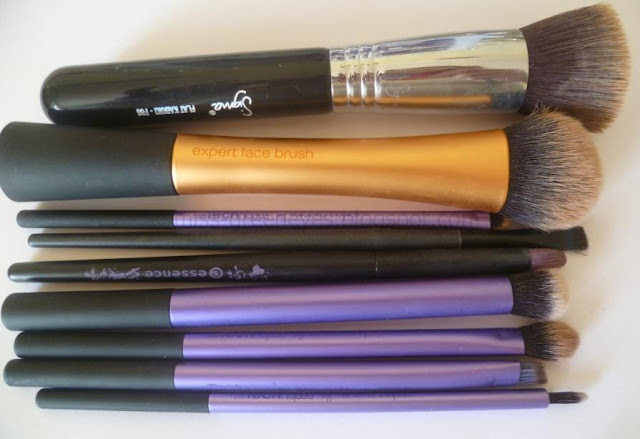 At almost €18, it was the most expensive makeup brush I'd ever bought - and the first decent one. The reviews were all correct - this brush changed my foundation routine and it made such a difference to the lasting power of my foundation. BUT. It's an absolute nightmare to clean. I actually put off using it some days because I knew that one more foundation application would mean that it'd need a deep clean. Nothing I tried could get it white again. I tried baby shampoo, olive oil, antibacterial soap, cleanser - nada. I didn't buy a specific brush cleaner because there wasn't one readily available to me. I also didn't use surgical spirits because I hate the smell of it. Enter google. 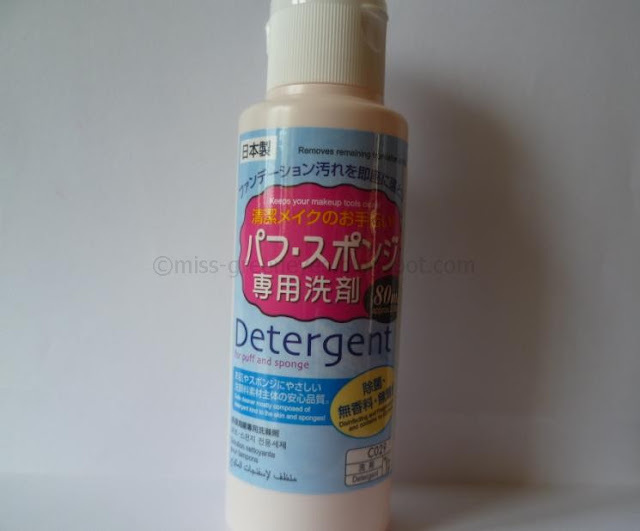 A while back, I came across this post written by Juli from Bun Bun Makeup about how great the Daiso Detergent for Puff and Sponge was. I knew I had to get my hands on a bottle of that detergent, so I had a look on eBay and found it from this seller for the incredibly bargain-friendly price of €4.50 for an 80ml bottle. I ordered it on May 23rd - and received it this morning. I was genuinely amazed to see it arrive so soon, all the way from China?! Unreal. I couldn't wait to put it to work. Haven't a clue what the packaging says, but there are English instructions and ingredients on the back. Then I filled the bowl with water - rough proportions about 10% detergent to 90% water. 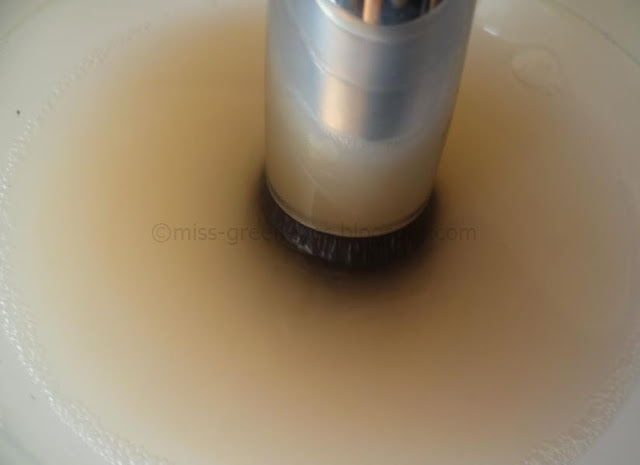 Dunk the brush in, and swirl it around for about 10-15 seconds. After, take it out, rinse it under clean running water, AND BE AMAZED. I have never gotten it that clean before. Especially in under 15 seconds. The stuff is amazing. 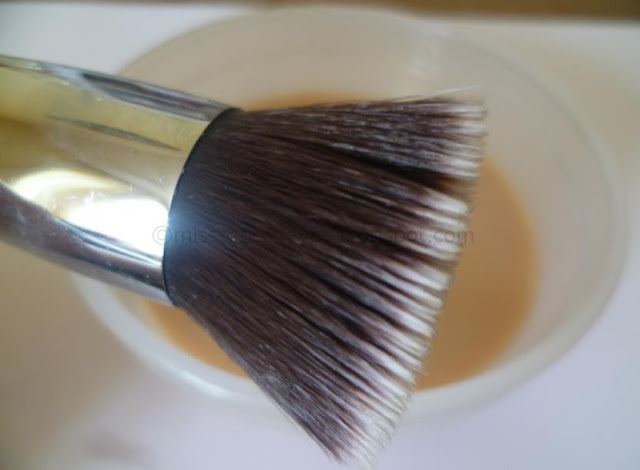 I used a fresh bowl of detergent/water for the rest of the brushes, I can't get over how well this cleans. Not many products get HG status from me, and especially after using them for the first time, but this is just........fantastic. I know I'm probably completely overreacting and there's a very simple alternative that everyone else uses that I don't know about, but for now - I'm in love with a Japanese detergent. Nor mine, I almost didn't want to use it this morning! 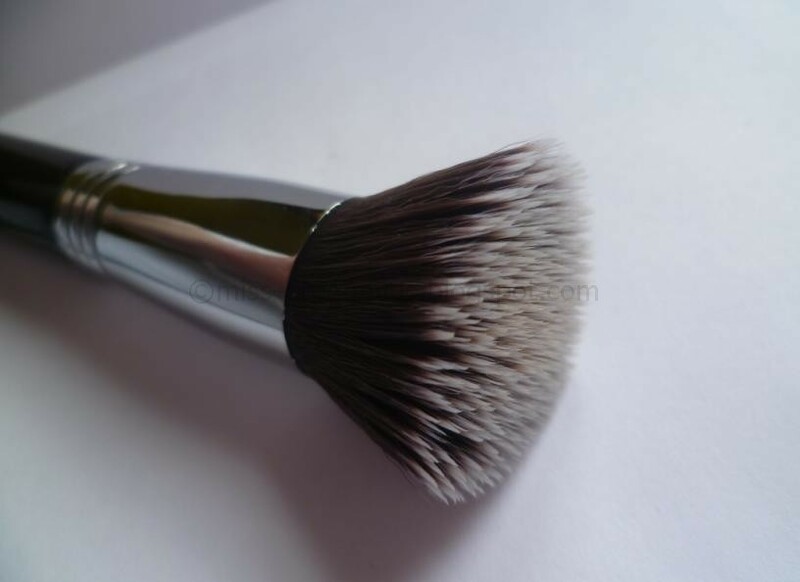 Oohh me likey I adore the brush and now want the cleanser! It's the best stuff I've ever tried, definitely going to keep repurchasing that one! That is great! I want it! You will love it, it's brilliant! I know! Mine hasn't been white since the day I took the plastic cover off it. Wow! Wonder what the ingredients are in the cleaner? I know my skin is sensitive to anything like that. But I guess a good rinse afterwords would sort that out! Going by the back of the pack, the ingredients are: Polyoxyethylene alkyl ether, Fattyacid alkanolamide, alkyl betaine (all common in detergent/shampoo) and water softener. That seems a bit vague to me but it doesn't smell, and I'd give it a rinse with shampoo or conditioner too just to make sure it doesn't irritate your skin. Ok, wow!! Sounds amazing Sharon - I think I'll be picking this up! 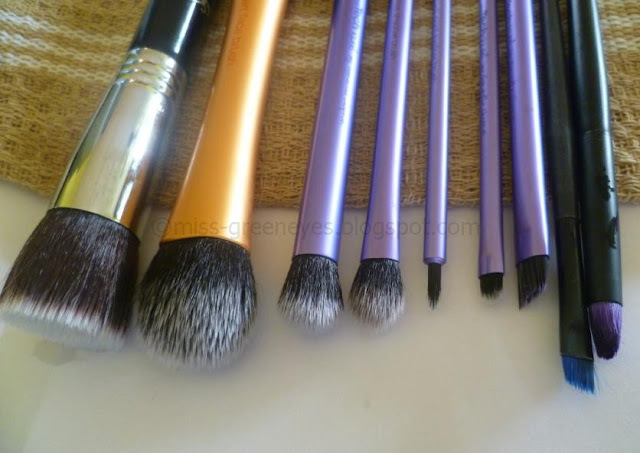 It's brilliant, makes brush cleaning so much quicker & easier! Hi Sharon, I saw you mention this on snap in relation to your style pro review and had to find out more. I wonder could I use it for my Beauty Blender too? Going to buy it now anyway but if I could it would be a total game changer. Hi Sarah-Jane! Yes, you absolutely could use it for your Beauty Blender, I think it was originally intended just for sponges and puffs!